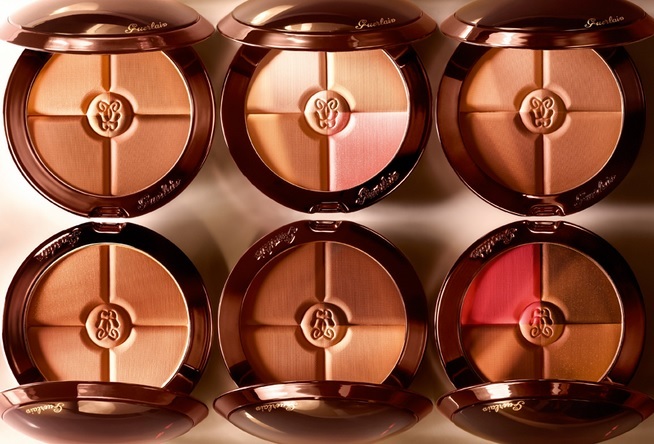 It's the season to glow and there's no easier or more beautiful way to go it then with the Guerlain Terracotta collection, back again this year for your bronzing pleasure! Terracotta 4 Seasons Tailor-Made Bronzing Powder - $82 - in 6 shade collections: 01 Ivory, 02 Sheer Blondes, 03 Sheer Brunettes, 04 Blondes, 05 Brunettes and 08 Ebony - offers 4 matte shades in each compact making it easy to control the amount of colour and glow you want to achieve at any time of the year. Terracotta Bronzing Brush - $47 - with the perfect natural bristle density for the optimal application of Terracotta bronzing powders. Terracotta Joli Teint Beautifying Foundation - 30ml - $58 - in 5 shades: Clair, Natural, Medium, Dark and Ebony - with an ultra-light and comfortable texture that covers imperfections and evens skin out for flawless looking skin with a sunny natural glow. Contains chlorella extract - to activate microcirculation to nourish and tone the skin; nasturitium extract - to stimulate skin oxidation to boost radiance and vitality; and SPF 20 to protect against UV rays. Terracotta Skin Healthy Glow Foundation - 30ml - $57 - with a lightweight, powdery fluid cream texture that evens out skin while illuminating it with a subtle glow and is suitable for all skin tones. Terracotta Sunless Tinted Self-Tanning Gel - $61 - the tint offers instant tan as well as making it easier to see where it's been applied with self-tanning results that show up within an hour and adds a healthy glow that lasts up to 4 days. Terracotta Jambes de Gazelle - $62 - with a watery-gel texture that offers instant colour that lasts all day and then washes off with soap and water. Available now at Guerlain counters across Canada - and if you are at the Eaton Centre today, be sure to drop by Sephora between 11:30am-1:30pm for a Terracotta makeover and to hang out with me - details can be found here!